Hinduism is a religion of 330 million gods. Hinduism originated in India. Hinduism is largely based on the teachings from Vedas. Hindus believe that the soul can be reincarnated, undergoing a cycle of rebirth. Hindus hold the belief of the four Vedas high in their mind. This is considered the most ancient scripture throughout the world. Lord Brahma, Lord Vishnu, and Lord Shiva are the creator, protector, and destroyer respectively. 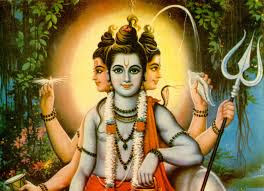 These are the three main deities in Hinduism. Besides them, Lord Ganesha, Lord Krishna, Lord Hanuman, Lord Rama, and Goddess Parvati are the most popular deities in Hinduism. People who follow Hinduism are called as “Hindus.” Hinduism is also known as “Hindu Dharma” (हिंदू धर्म), ” Hindu Religion, “Sanatan Dharma (Eternal Religion),” “Vedic Religion,” or Vedic Dharma. The religious tradition of Hinduism is responsible for the creation of such concepts and practices as Yoga, Ayurveda, Vastu, Jyotish, Yajna, Puja, Tantra, Vedanta, Karma, etc. Hindus believe in one God named as “Brahman” but view other Gods and Goddesses as manifestations of Him. Therefore, in practice, they worship more than one God. Most Hindus worship God in the form of an idol. Rivers, mountains, trees, animals, and natural things which are useful for a human being are revered in Hinduism. Cow is the most revered animal for Hindus. Hinduism is the world’s oldest known religion. History of Hinduism can be traced back to 5000-10,000 B.C. Most of the Hindus do not eat beef and/or pork. They also do not eat non-vegetarian food on auspicious days. Hinduism strongly advocates vegetarianism. Food is highly revered and wasting the food is considered as a very bad habit. Hindus believe that a soul is able to undergo numerous lifetimes within a physical body. All of the past lives that you have led, contribute to the person you are today. Karma is the universal principle of cause and effect. Our actions, both good and bad, come back to us in the future, helping us to learn from life's lessons and become better people. There is no concept of Creation and a Creator. The world came from God, exists in God and will return back to God, just like waves arise from the ocean, exist in the ocean and subside back into the ocean. The place of worship of Hindus is called as a temple. Salvation is the ultimate goal of a Hindu’s life. It is the third largest religion of the world with more than 1 billion followers. Reincarnation is the phenomenon where the immortal soul is continuously born and reborn in any one of 8,400,000 life-forms until it attains moksha. Moksha is ultimate liberation. Hinduism has no single founder. It has been evolving over the thousands of years and will continue to. Hindus believe that all living entities have a soul, or ãtma. Each is eternal – it was never created and will never perish. The ãtmã is characterized as unchanging truth, consciousness and bliss. Hinduism is not a religion but a way of life. Hinduism grants you a healthy lifestyle. The Hindu practices like bath in the morning, do Yoga, stay away from meat etc. promote health and hygiene. According to Hinduism, as there are four seasons in a year, there are four Yugas namely Satya-Yuga, Treta-Yuga, Dvapara-Yuga, Kali-Yuga. At the end of a full cycle of four Yugas, the life on the earth comes to an end (though not completely) and a new era starts. The humanity enters into a new era. The present era is known as Kali-Yuga i.e. Dark Age. Hinduism consists of different sects like Shaivism, Vaishnavism, and Shaktism. The common people follow all the three sects collectively worshiping Lord Shiva, Lord Vishnu, and Devi.